In the 1850s increasing numbers of Jewish settlers arrived in Shreveport, eager to establish businesses and practice their trades in the rapidly developing town. Many of these early arrivals brought with them a dedication to preserve their faith and uphold their traditions, despite Shreveport’s distance from their home communities in Germany and France. A small congregation began to hold regular services in 1857, meeting at the home of a Mr. Hyams under the leadership of Rabbi Julius Lewin. The group formally adopted the name of Congregation Har-El in 1861 and held services at the home of Abraham Winter, a prominent businessman and community leader. The Civil War interrupted Har-El’s growth, and for the duration of hostilities the congregation depended upon lay leaders and occasional visiting rabbis to conduct services. 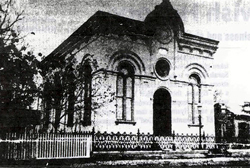 Following the war, the congregation re-chartered in 1866, adopting the name of Hebrew Zion. The congregation generally identified with the Reform movement, although some members adhered to more traditional practices. Until a building could be constructed, the congregation met at Bogel’s Hall at 121 Texas Street. Construction of the congregation’s first temple, on Fannin Street between Edwards and Market Streets, began in 1869 and was completed the following year. During these early years, disagreements over religious observances nearly split the congregation in two. After building the new temple, the congregation adopted the Reform prayer book, an act which angered some members. In 1875, a number of Hebrew Zion congregants broke off to establish an Orthodox congregation named Emanu El. This short-lived congregation even had its own rabbi, Nachman Benson. Two years later, a compromise was reached whereby the two congregations would reunite with a Reform affiliation while remaining sympathetic to traditional Judaism. In 1907 members organized a temple Sisterhood, which joined the National Federation of Temple Sisterhoods in 1913. The organization served the congregation and the community in a variety of capacities, significantly expanding the Jewish presence in Shreveport. The new building was dedicated on October 22, 1915 and soon after the congregation adopted the name B’nai Zion. A contemporary newspaper account described the building as “an architectural gem and an ornament to the city.” The dedication ceremonies included the performances of a variety of musical compositions, placing works by Wagner and Puccini alongside Jewish liturgical pieces. After World War II, the congregation enjoyed its “Golden Age.” By 1945, B’nai Zion had 308 members. Over the next few decades, the congregation enjoyed tremendous growth, reaching its peak in 1962 with 430 members. Due to its growth, the congregation once again began looking for more modern accommodations. The new building on Southfield Road, erected in 1955, provided ample space for the congregation’s various social and religious organizations, including a Temple Sisterhood, Brotherhood, Hebrew School, Temple Youth, Children’s Choir and Library. The dedication ceremony the following year included nearly 600 attendees from a variety of faiths. Following B’nai Zion’s move, congregants sold the old Cotton Street Temple to the Knights of Columbus. For many years the words “Knights of Columbus #1108” covered the original words “B’nai Zion Temple” on the front façade, although the Star of David above the letters remained unmodified. In 1993, a private foundation bought the property and implemented basic preservation measures. 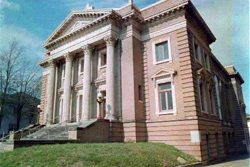 The following year, the building was placed on the National Register of Historic Places as one of only ten grand Beaux-Arts buildings still standing in Louisiana. The building is considered one of the finest examples of the Beaux Arts architecture style in the state. Currently, the historic structure remains vacant and is gradually deteriorating. 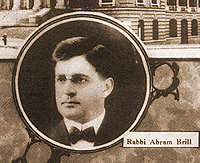 B’nai Zion benefited immensely from the long tenures of Rabbis Abram Brill and his successor, Rabbi David Lefkowitz Jr. Born in Ogsdenburg, New York in 1876, Abram Brill graduated from Hebrew Union College and served with distinction at congregations in five states before settling in Shreveport. Brill assumed the pulpit at B’nai Zion in 1920 and let the congregation for the following two decades. During his tenure, B’nai Zion saw dramatic increases in membership, and Brill encouraged congregants to take a more active role in the Shreveport community. He promoted dialogue between Jews and Christians, stating in one of his first public speeches: “Jews and Christians should work together for moral, religious and social ideals, realizing that religion lays stress on harmony.” Brill also advocated for the creation of a Jewish Federation in Shreveport, which would promote cooperation among the city’s Orthodox and Reform congregations, but this would not be achieved until the end of his term, in the year 1940. Brill’s successor, Rabbi David Lefkowitz Jr., first assumed a pulpit position as an assistant rabbi to his father, David Lefkowitz Sr., in Dallas, Texas. 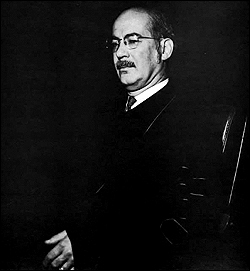 He joined B’nai Zion in 1940 as Brill’s associate rabbi. Upon Brill’s retirement in 1941, Lefkowitz assumed leadership of the congregation, a position he served until 1972. During World War II, Lefkowitz joined the Air Force as a chaplain. While stationed in Germany, Lefkowitz witnessed first-hand the aftermath of the Holocaust. The experience left a profound impact upon him, and he returned with a commitment to the ideals of Zionism and Israeli statehood. He maintained Brill’s tradition of community involvement, and became a beloved figure in the congregation and the larger Shreveport community. Following his retirement in 1972, Lefkowitz continued to serve B’nai Zion as rabbi emeritus until his passing in 1999. In 1972, Rabbi Richard Zionts replaced the retired Rabbi Lefkowitz, and served B’nai Zion for sixteen years. Over the last twenty years, the congregation has been served by Rabbis Michael Matuson, Harold Caminker, and Harold Robinson. Currently, Jana De Benedetti serves B'nai Zion as rabbi. Today, the congregation maintains a full range of social and religious functions serving Jews in Shreveport and throughout northwest Louisiana.